These days blockchain technology shows up in the news with regularity. Deservedly so. It promises a new level of security for a host of online transactions, and not just for cryptocurrency. 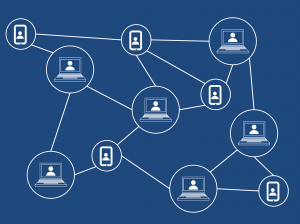 Blockchain has proved useful for ensuring the security of stock trades, currency exchanges, retail sales, contracts, diamond and gold exchanges, health care data, and more. Blockchain presents a rather daunting challenge to would-be hackers. It is, essentially, an online ledger with identical copies distributed around the world. Hacking one copy would instantly betray it as out of sync with its myriad copies; and hacking all copies at once is, as of this writing, beyond the technological reach of even the most adept hackers. When a transaction is posted on the network between two parties, other nodes on the network compete to solve a mathematical proof that locks that transaction into everybody else’s ledger as well. So if you wanted to go back and hack the Blockchain ledger, you would have to undo every single other prior transaction. And that proof of work and the chain aspect of the block—a block is a transaction—is chained to all prior blocks, is what makes this the interesting technological innovation that the Blockchain is. Looking for someone to thank for blockchain? Try spammers. In popular lore, breakthrough technologies are born overnight thanks to a lone visionary. It makes for inspiring storytelling, but it’s almost never true. Take, for instance, iPhone. IBM explored touchscreen technology for phones 47 years before iPhone’s debut. And the idea for developing touch-screen tablets didn’t come from Jobs. A skunkworks at Apple pursued it in secret until they dared show it to their capricious and unpredictable boss—who at first dismissed it out of hand. In 1992, the growing spam problem promoted computer scientists Cynthia Dwork and Moni Naor to produce a paper entitled, “Pricing via Processing or Combatting Junk Mail.” In it, they proposed filtering out cyber attacks by posing problems human minds could readily solve but computers couldn’t. The idea proved useful. Soon dubbed a proof-work-system, or POW for short, it found its way into a number of applications we now all encounter every day. When you must prove you’re not a robot—say, by correctly typing in CAPTCHA characters or identifying related photos on a grid—you’re dealing with a derivative of Dwork’s and Naor’s proposal. In 1997, British cryptographer and crypto-hacker Adam Back proposed a proof-of-work-based spam filter he called Hashcash. It proved significant, for Microsoft improved on Hashcash’s technology to create proof-of-work-based spam filters for Exchange, Outlook, and Hotmail. And it was Hashcash’s technology that Satoshi Nakamoto adapted when he (she?) used blockchain as the underlying technology for an electronic P2P based cash system, namely, bitcoin. … The security features work toward enhancing confidence in the network and driving cost benefits in areas such as exchanges. The real-time functionality may lead to shorter, and less costly, settlement cycles on trade day. … blockchain has transformative potential for those who dig in and understand it. Top organizations are testing its use cases. Now is the time to take a long-term, purposeful approach to finding the most valuable areas and smart ways to leverage the value that blockchains create. Bitcoin’s run-in with ComboJack notwithstanding. See my review of Brian Merchant’s biography of iPhone, The One Device.